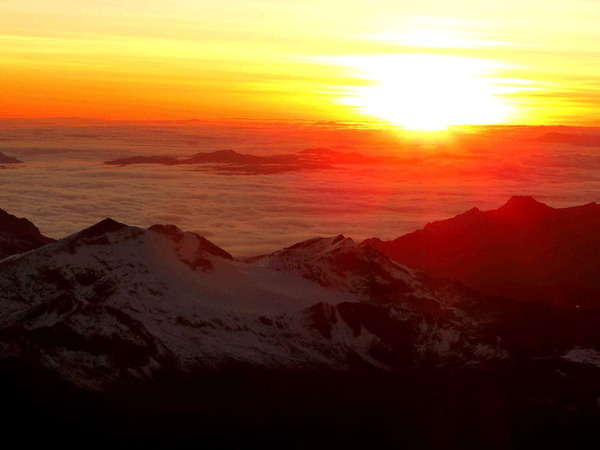 Unlike the Cordillera Real, the Cordillera Occidental forming the frontier between Bolivia and Chile is entirely volcanic. On either side we find the most beautiful natural preserves of the Altiplano: Volcano Isluga National Park, Salar de Surire Natural Monument, Vicunas National Preserve and finally Lauca National Park on the Chilean side and Sajama National park, across from the latest in Bolivia and hosting the highest summits in the country. This exceptional program, totally off-the-beaten-path leads us to admire a particularly abundant fauna: vicunas, alpacas, ñandus (close relative of the ostrich), without forgetting the flamingoes and other ibises, under the omnipresent stare of the highest volcanoes in Bolivia. 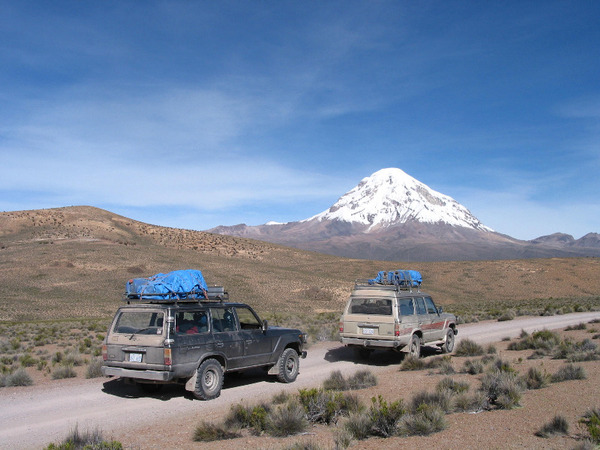 Departure from the hotel at 9 a.m. in a private vehicle for the beautiful traverse of the altiplano. 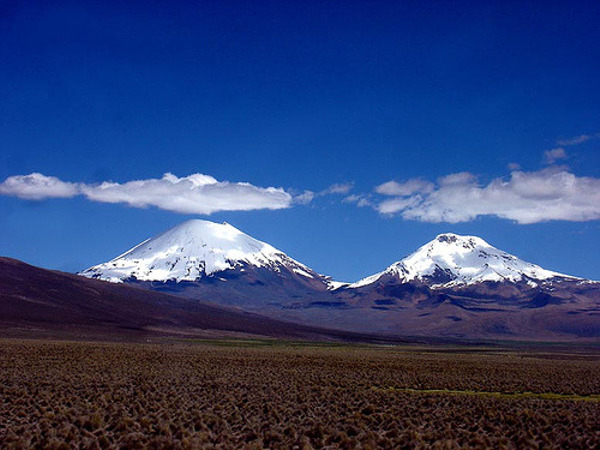 We head south to Patacamaya, from where we turn to the West and let ourselves be guided by the majestic Sajama Volcano. On the way, we stop by chullpas (carangas sepultures) empty today after their systematic pillaging. 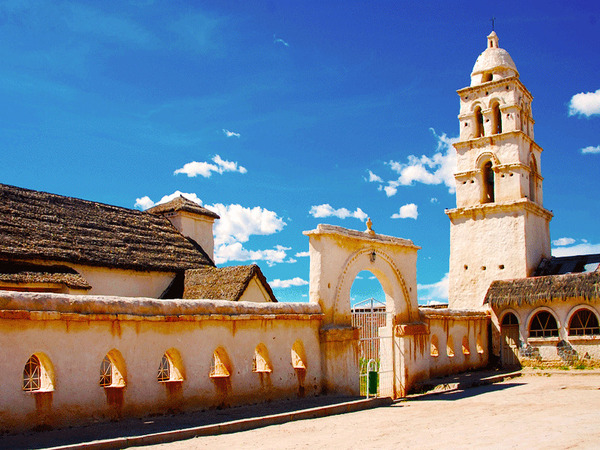 Short stop in the village of Curahuara de Carangas with its colonial church known as the Sixteen chapel of the Altiplano. The church, indeed, possesses some perfectly preserved intricate frescoes, contrasting with the abandoned atmosphere of the village. The paved road now climbs through a surprising panorama of canyons and rock formations, and then we find ourselves on Sajama’s desolate plateau. We enter the park by a dirt road taking us to the ranger station. Lunch on the way. Night at Doña Isabel and Don Marcelo’s (Basic comfort). Night at the Oasis hostel*. Visit to the geysers in the morning by 4WD. The view over the bubbling pools spreading over a few hundreds square meters is just amazing in this very volcanic area. We can even try to cook eggs in the slightly sulfuric water. 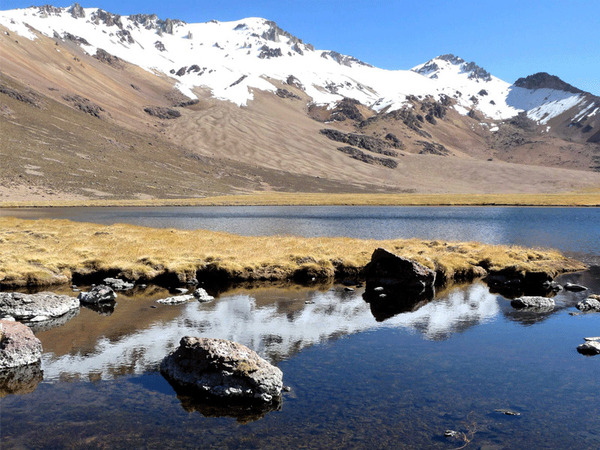 The plateau will be be reached after another hour and we will find there the beautiful Laguna Sorapata. A wonderful place surrounded by the impressive copper colored mountains, great for the comtemplation and for shorth climbs to the surrounding peaks. Note: during the trek the bags will be carried by mules. 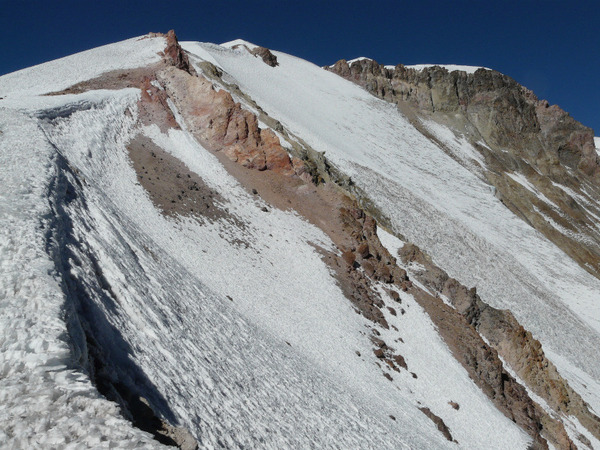 Option to climb to the base of the volcano Condoriri Grande at 5380 m elevation (ask to the guide) and to the next saddle depending on the snow (5542m). We will walk around the Sorapata lake to join the saddle with many opportunities to see some viscaches (a funny rabbit-squirrel) and some medicinal plants still used by the park inhabitants. 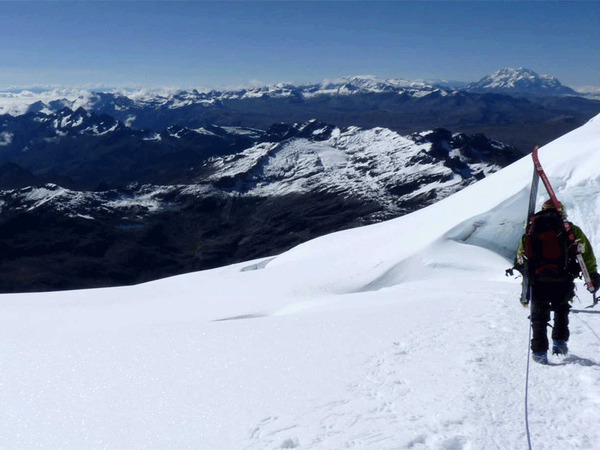 After climbing for one hour we will be at the highest point of the trek (5065m) in a moon like landscape. With a bit of luck we will spot the trace of an Andean puma on this volcanic floor. 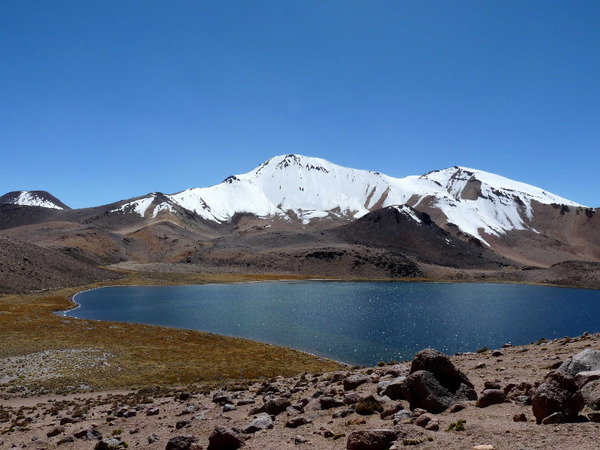 We will find the last lake of the trek after a short descent, the laguna Chiar Khota (5000m el.) 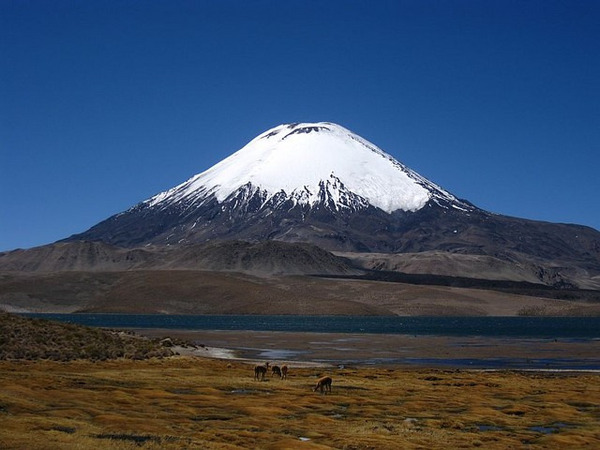 which we will follow while enjoying an exceptional view over the Sajama volcanoe. We will then walk down for a while among the colonies of yaretas (thousand years old plants growing very slowly (1mm/year)). Back to the 4WD we will drive to the thermal sources for a well deserved bath before going to the village of Sajama. Night at the Tomarapi Ecolodge***. We depart at 9 a.m. We reach the international road a few kilometers away and then head south on the sandy and treacherous tracks nearby the Chilean border. After crossing río Lauca, appear out of nowhere the most beautiful polychromatic chullpas of Bolivia (chullpas are the pre-Inca tombs of Aymara lords), spread out in a majestic scenery. 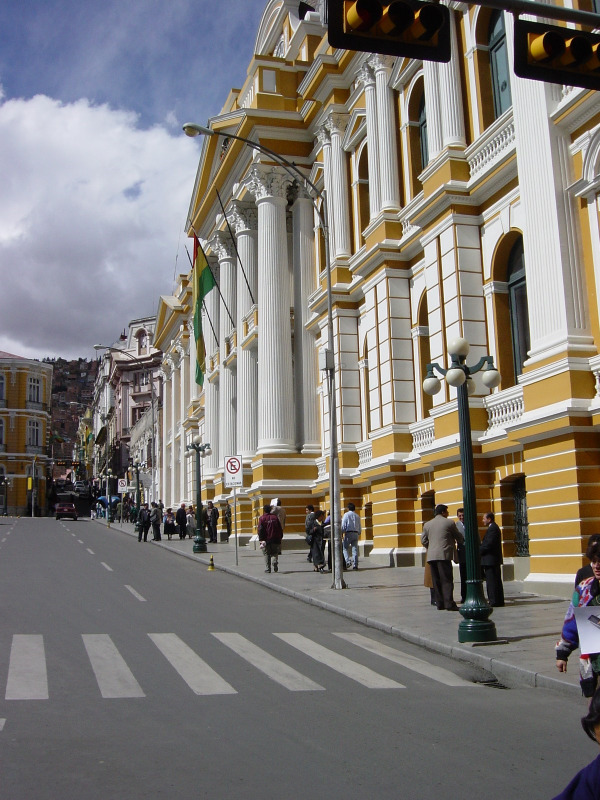 We visit the site and then return to La Paz at the end of the day. Cold lunch (included). Dinner open. Transfer Sajama -Campo Base Parinacota. Around midday a 4WD will take us to Inkamarka at 4750 m elevation. We will there meet the carrying team. 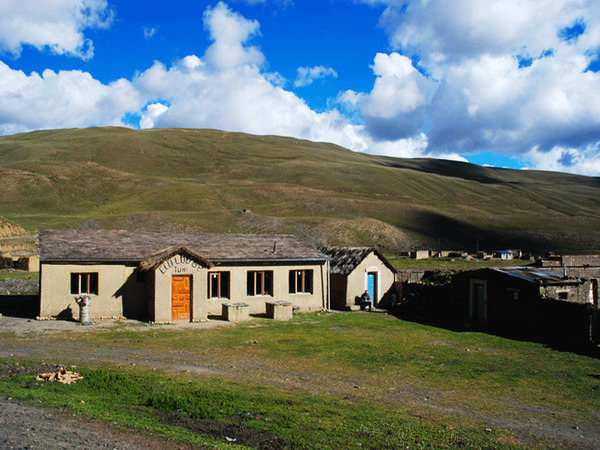 The Parinacota base camp at 5150 m elevation will then be reach after 2 hours walking. Early start for a tentative ascent to the summit. 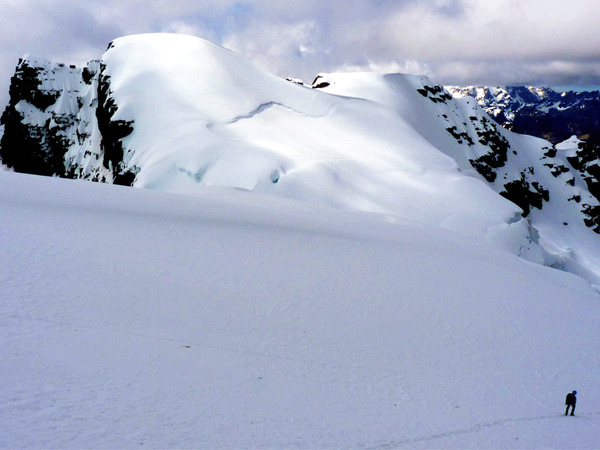 There are no technical difficulty but a specific equipment is required (ropes / crampons / ice axe). 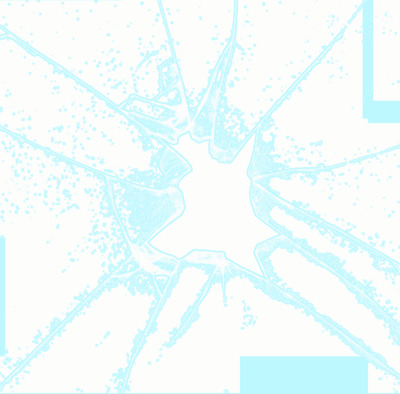 6 to 8-hour return, depending on the weather condition and fitness of each participant. From the base camp, we will arrive with the porters to the vehicle in Inkamarka after 45 minutes waking. Descent to the village of Sajama by 4WD for a well-deserved bath in the local hot springs. Cold lunch. All included. 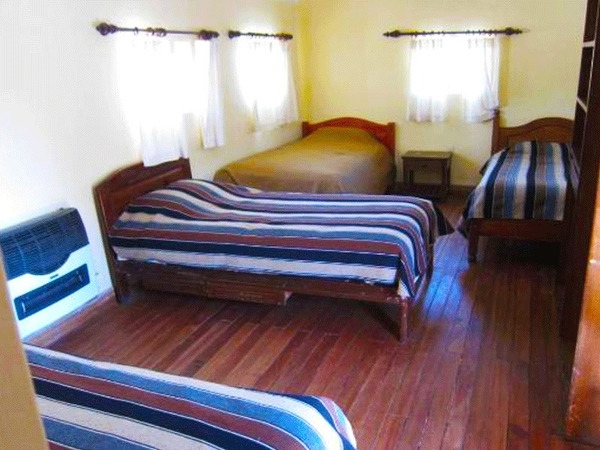 Accommodation at the Doña Teodora’s house near the hot springs (basic comfort). Visit of the geysers in the morning. This particularly active area contains a unique display of bubbling pools spread over hundreds of square meters. We can try cooking eggs in their slightly sulfuric water. We will meet our team of porters around midday, before walking 2 hours to the base camp at 5000 m.a.s.l. Early start for the summit attempt. 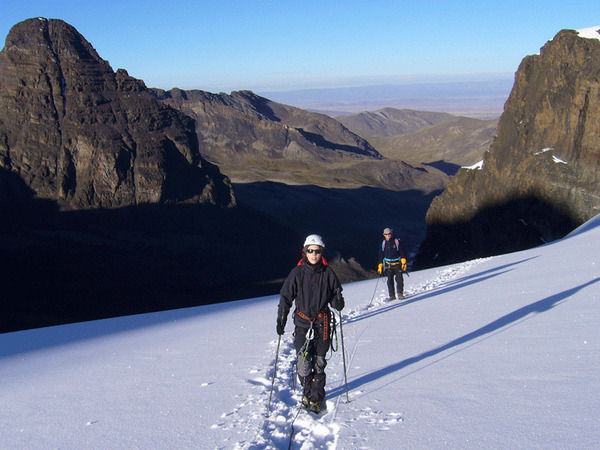 There is no technical difficulty but a specific equipment is required (ropes / crampons / ice axe.) Approximately 8-hour return trip, depending on the weather conditions and fitness of each participant. 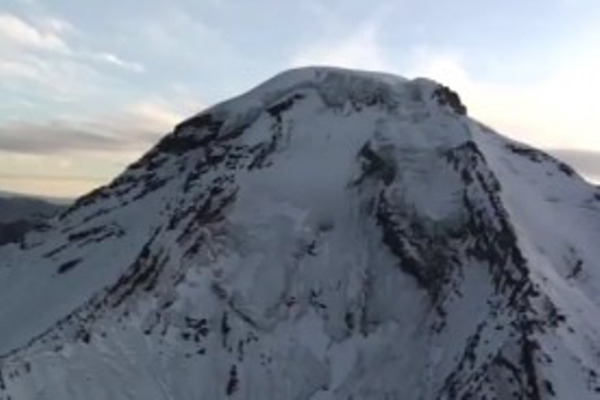 From the base camp, it is a 45-minute walk with the porters to return to the vehicle. At the end of the day, return to the village of Sajama by 4WD for a well-deserved bath in the hot springs. We will head south to enter the Urus country by sandy and treacherous dirt roads. 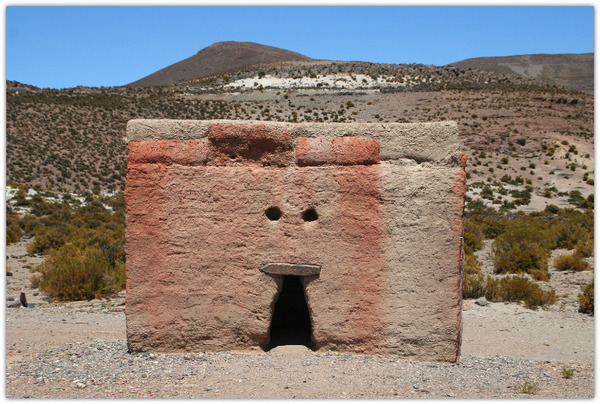 After crossing the Río Lauca, some polychromatic chullpas, the most beautiful of Bolivia (chullpas were tombs of the Aymara kings; pre-Inca era) will appear. 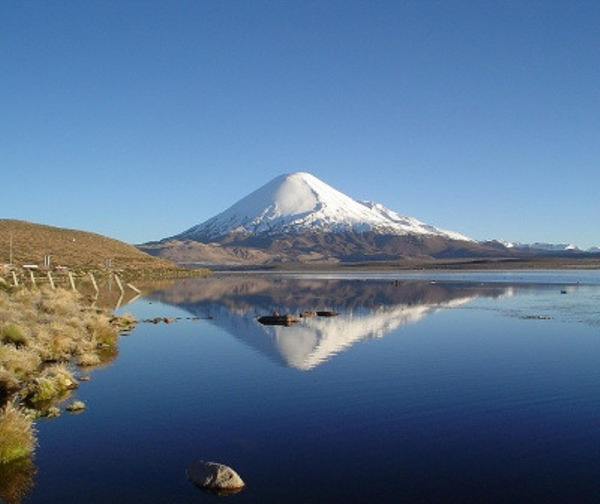 We can take the opportunity to visit this site between lagoons and volcanoes. We will get back to our vehicle after lunch. The road climbs the side of the volcano Acotango, up to an abandoned sulfur mine at 4800 m.a.s.l. We will continue on a rocky track until the camp. Start at around 2:00 to 3:00 a.m. We will follow the arete by a steep rocky trail, before reaching the snow line. We will rope up there to reach the crater. But the top will be on the other side of the crater which we will walk around (6 to 7-hour hike). The view from the top is just amzing; with the most beautiful volcanoes of the Cordillera Occidental around us: volcano Guallatiri, active and blowing sulfuric fumes, Parinacota, Pomerape and Sajama while shimmer on the Chilean side, the turquoise lagoons of Cota-Cotani and Chungara. Return to the village of Sajama in the afternoon. Total walking time: 8/10 hours. Cordial welcome. It's a clean hostel with warm water. The ecolodge is a group of small houses which have been built by people from the community of Tomarapi. 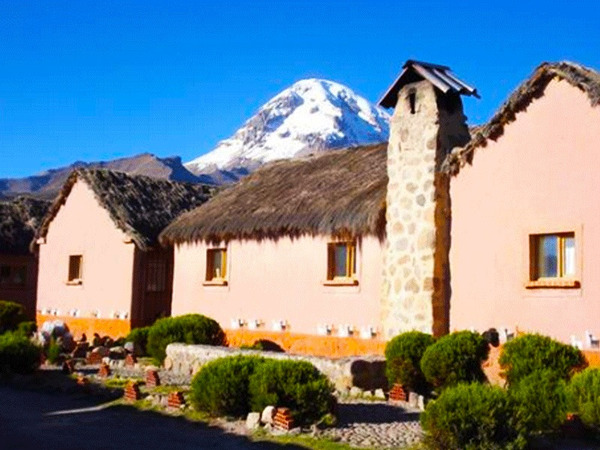 This ecolodge is a peaceful place close to Sajama Volcano. The rooms have been built with materials from the area. 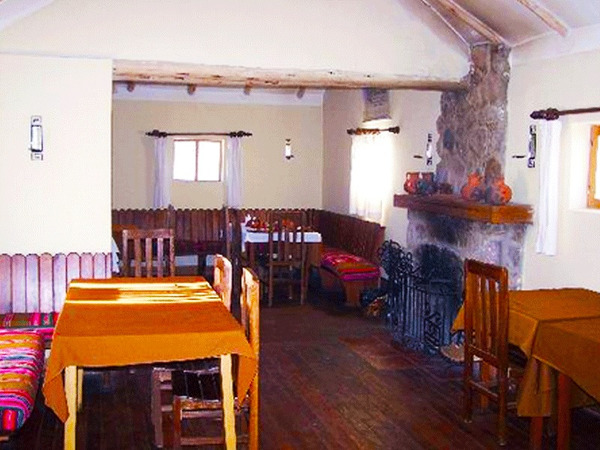 The dinning room has a chimney that makes the place warm. The food is simple but delicious.